Fig. 1 Overview of the location of Iunca within Tunisia. 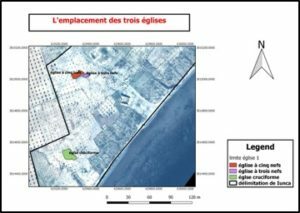 The site of Iunca is located on the south-east coast of Tunisia, forty-five km south of Sfax and 12 km south of Mahares (Fig. 1). The territory is located in the Roman and Byzantine province of Byzacena, and the Roman name of the site was Macomades Minores (the identification is based on the finding of a miliarium). At the end of the 4th c. the name was changed to Iunca. The city was on the main route between Carthage and Alexandria, also one of the main interior routes from the region of Sufetula and Capsa (Gafsa). At the Council of Carthage in AD411, held between the opposing Donatists and Catholics, the city was represented by the Donatist Bishop Valentinianus Iucensis (Maier 1973 p. 55, n. 62). The “Notitia Dignitatum” (AD484 – Notitia Provinciarium, Byz. 105) indicates the presence of a bishop in 484, and the monk Fulgentius located his monastery on Kerkenna island at the beginning of the 6th c. (Ferranuds, Vita Fulgentii 60) because of its vicinity with Iunca. A bishop in Iunca is mentioned still in AD883 (Mesnage 1912, 129). The site has an important phase from the Byzantine period. According to Procopius (III, XV, 8) the Byzantines approached the territory from the south in order to conquer the region from the Vandals in 533. The currently known archaeological remains include a fort in the central-southern part of the site, three churches in the southern part and a cistern in the northern part (Fig. 2). Fig. 2 Overview of the known archaeological remains at the site of Iunca. The site of Iunca has never been excavated. Only three large churches have been subject to non-stratigraphic investigation (Fig. 3). 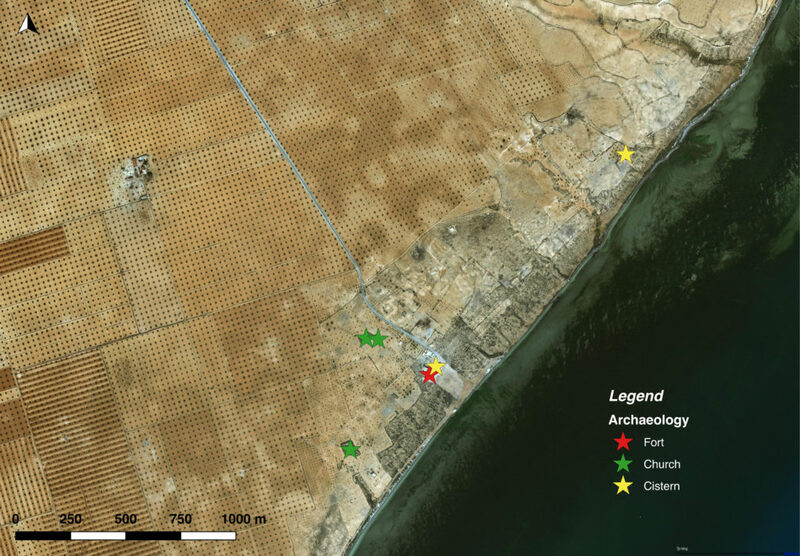 All three buildings were only partially excavated between 1930 and 1950 (for a recent summary on these buildings see Baratte & Bejaoui 2014 with previous bibliography). Basilicas I and III were studied by Noel Duval in the 1960s, but without further excavations. 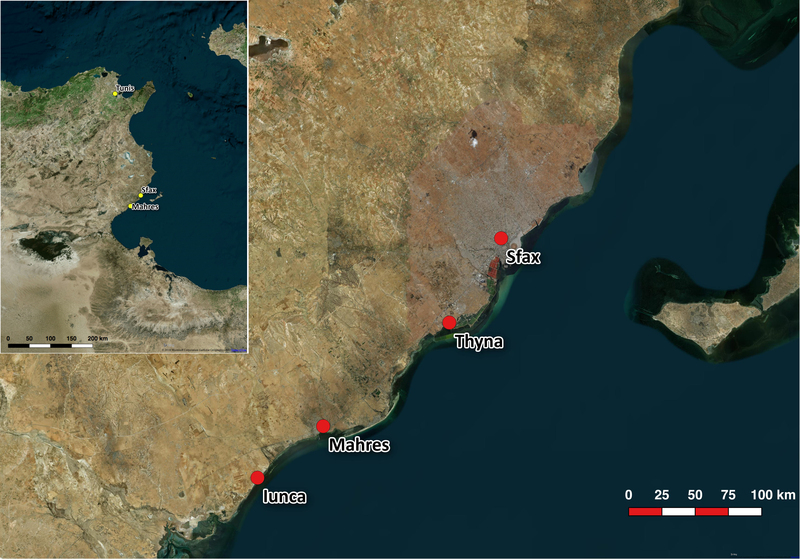 All of these buildings are located in the southern part of the city, with basilicas I and II about 200m west of the fort and basilica III about 300 m south, 200 m from the coast. Basilica I and II were excavated together, and the mosaic mentioning the bishop Quodbultdeus was detached and brought to the Bardo museum. The basilica I also contained a crypt for the cult of the Saint. Basilica II is close to the larger five-nave structure, and it has been suggested that basilica II was in fact the original church, transformed into a baptistery when the larger five-nave basilica was built, possibly in the Byzantine period. Basilica III was discovered in 1947 and excavated non-stratigraphically from 1949 to 1951. 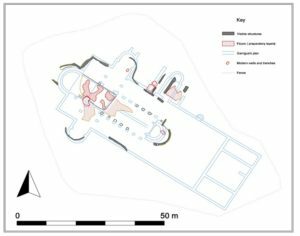 Only a preliminary report was published, with a partial plan of the structure, and the church was never entirely excavated (Fig. 4). Fig. 3 Overview of the churches locations at Iunca.